'The Three Laws of Robotics', in I, Robot (1950), Frontispiece. A conflict arises when a religious community insists on the absolute truthfulness of all statements recorded in the Bible. This means an intervention on the part of religion into the sphere of science; this is where the struggle of the Church against the doctrines of Galileo and Darwin belongs. On the other hand, representatives of science have often made an attempt to arrive at fundamental judgments with respect to values and ends on the basis of scientific method, and in this way have set themselves in opposition to religion. These conflicts have all sprung from fatal errors. All the remedies for all the types of conflicts are alike in that they begin by finding the facts rather than by starting a fight. As quoted, M.Guy Mellon in Presidential Address, Purdue University. 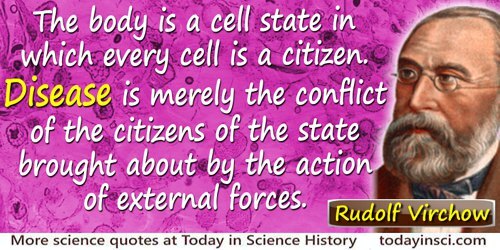 Printed in Proceedings of the Indiana Academy of Science (1943), 52, 12. Are we using science in ways that it wasn't intended to, in which case we should be a little careful, or are we using faith in ways that faith wasn't really designed for? 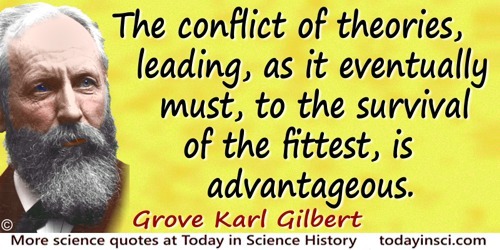 There are certain questions that are better answered by one approach than the other, and if you start mixing that up, then you end up in … conflict. By no amount of reasoning can we altogether eliminate all contingency from our world. Moreover, pure speculation alone will not enable us to get a determinate picture of the existing world. We must eliminate some of the conflicting possibilities, and this can be brought about only by experiment and observation. Reason and Nature: an Essay on the Meaning of Scientific Method? (2nd Ed., 1964), 82. Every great scientific truth goes through three states: first, people say it conflicts with the Bible; next, they say it has been discovered before; lastly, they say they always believed it. Attributed; it does not appear directly in this form in any writings by Agassiz. This version of the quote comes from the Saturday Evening Post (1890), as cited in Ralph Keyes, The Quote Verifier (2006), 226. 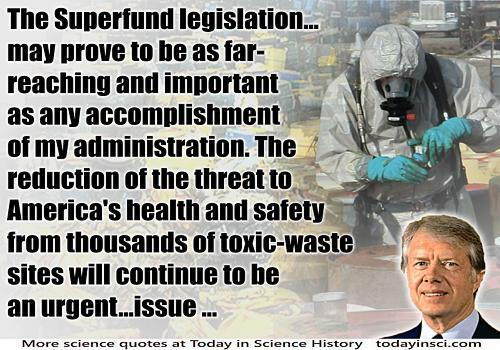 Since the quote was not printed within quotation marks, it is unlikely that this is a verbatim statement. Keyes discusses variations of the “three stages of truth” that have been attributed to a various other authors, but provides some substantiation with examples of similar quotes linked to Agassiz as related in second-person accounts. In History of Civilization in England (1861), Vol. 2, 408. Our Inner Conflicts: A Constructive Theory of Neurosis (1945, 1999), 240. I have often pondered over the roles of knowledge or experience, on the one hand, and imagination or intuition, on the other, in the process of discovery. I believe that there is a certain fundamental conflict between the two, and knowledge, by advocating caution, tends to inhibit the flight of imagination. Therefore, a certain naivete, unburdened by conventional wisdom, can sometimes be a positive asset. In R. Langlands, 'Harish-Chandra', Biographical Memoirs of Fellows of the Royal Society (1985), Vol. 31, 206. Atlanta Journal-Constitution, column also distributed by United Press Syndicate, American Know-How Hobbled by Know-Nothings (9 Aug 2005). In Eve Herold, George Daley, Stem Cell Wars (2007), 21. If we ought not to fear mortal truth, still less should we dread scientific truth. In the first place it can not conflict with ethics? But if science is feared, it is above all because it can give no happiness? Man, then, can not be happy through science but today he can much less be happy without it. Henri Poincaré and George Bruce Halsted (trans. ), The Value of Science (1907), 12. If, in the course of a thousand or two thousand years, science arrives at the necessity of renewing its points of view, that will not mean that science is a liar. 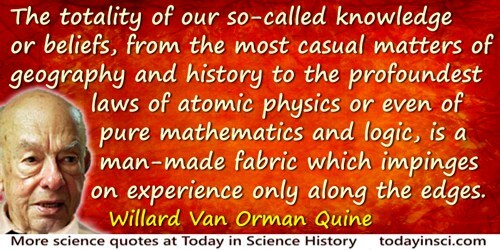 Science cannot lie, for it’s always striving, according to the momentary state of knowledge, to deduce what is true. When it makes a mistake, it does so in good faith. It’s Christianity that’s the liar. It’s in perpetual conflict with itself. In these days of conflict between ancient and modern studies, there must surely be something to be said for a study which did not begin with Pythagoras, and will not end with Einstein, but is the oldest and the youngest of all. In A Mathematician's Apology (1940, 2012), 76. 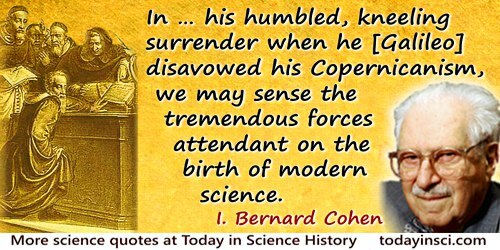 In … his humbled, kneeling surrender when he disavowed his Copernicanism, we may sense the tremendous forces attendant on the birth of modern science. In The Birth of a New Physics (1960, rev. ed. 1985), 126. It is this mythical, or rather this symbolic, content of the religious traditions which is likely to come into conflict with science. This occurs whenever this religious stock of ideas contains dogmatically fixed statements on subjects which be long in the domain of science. Thus, it is of vital importance for the preservation of true religion that such conflicts be avoided when they arise from subjects which, in fact, are not really essential for the pursuance of the religious aims. Modern Physics impresses us particularly with the truth of the old doctrine which teaches that there are realities existing apart from our sense-perceptions, and that there are problems and conflicts where these realities are of greater value for us than the richest treasures of the world of experience. In The Universe in the Light of Modern Physics (1931), 107. Neurosis is the result of a conflict between the ego and its id, whereas psychosis is the analogous outcome of a similar disturbance in the relation between the ego and the external world. Neurosis and Psychosis (1924), in James Strachey (ed. 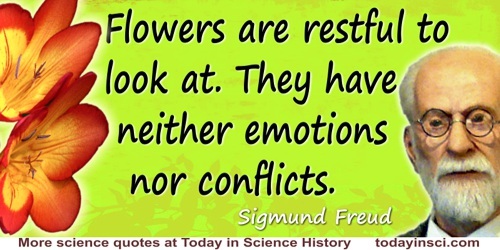 ), The Standard Edition of the Complete Psychological Works of Sigmund Freud (1961), Vol. 19, 149. The Dreams of Reason: The Computer and the Rise of the Sciences of Complexity (1988). In Vicki Cassman, Human Remains (2008), 69. Scientists are supposed to make predictions, probably to prove they are human and can be as mistaken as anyone else. Long-range predictions are better to make because the audience to whom the prediction was made is no longer around to ask questions. The alternative... is to make conflicting predictions, so that one prediction may prove right. 'Fossils—The How and Why of Collecting and Storing', Proceedings of the Biological Society of Washington (1969), 82, 597. The complexity of the world is the outcome of huge numbers of sometimes conflicting simple events. 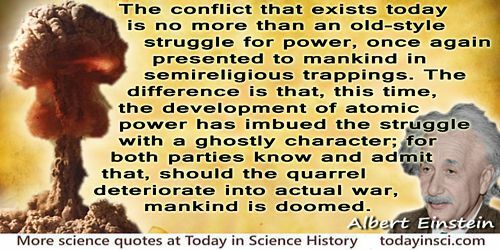 In History of the Conflict Between Religion and Science (1875), vi. 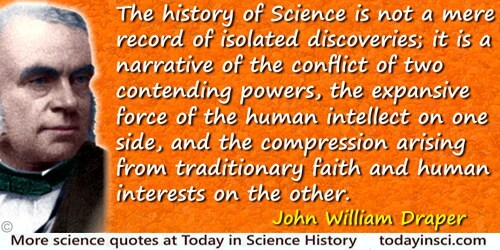 The humanities and science are not in inherent conflict but have become separated in the twentieth century. Now their essential unity must be re-emphasized so that 20th Century multiplicity may become 20th Century unity. As quoted in 'Humanities Head', Time (8 Jun 1942), 39, No. 23, 63. The main source of the present-day conflicts between the spheres of religion and of science lies in this concept of a personal God. The Structure of Scientific Revolutions (1962), 171. The uncertainty where to look for the next opening of discovery brings the pain of conflict and the debility of indecision. In Appendix, 'Art of Discovery', Logic: Deduction (1870), Vol. 2, 422. The ‘paradox’ is only a conflict between reality and your feeling of what reality ‘ought to be’. We make a lot of mistakes in the environmental space. … We don’t do a good-enough job of asking, “What are the fundamentals of telling a good story?” And that is not statistics, it’s usually not science, or at least complex science. It’s people stories. … It’s got to have adventure, it’s got to be funny, it’s got to pull my heart strings, it’s got to have conflict, setting, character. It’s a story. And if it doesn’t have those things, it can be the best-meaning story in the world, and nobody’s going to buy it. From interview with Dan Conover, 'A Conversation with Philippe Cousteau Jr.', Charleston City Paper (27 Jul 2012). You can't really discover the most interesting conflicts and problems in a subject until you've tried to write about them. At that point, one discovers discontinuities in the data, perhaps, or in one's own thinking; then the act of writing forces you to work harder to resolve these contradictions.